RMC provides a fully-furnished room, and linen which you can change each week. That means you don’t need to bring any of your own furniture – you’ll have a bed, bedside table, desk, chair, bookshelf and cupboard in your room, and you’ll have sheets, pillow, and doona all waiting for you when you arrive. 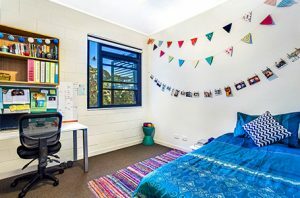 Some residents like to personalise their room with their own doona cover, cushions, and decorations, so think about bringing those things if you’d like. You can also easily buy small items at the Macquarie Shopping Centre, which is just across the road. Make sure you bring plenty of warm clothes – layers are best! Sydney can be surprisingly cold in winter. You will need to bring your own coat-hangers for clothes you want to hang up. If you’re self-catered or semi-catered, you’ll need some cooking equipment. Best to start with the basics – a frying pan, saucepan, mixing bowl, spoon and flipper for cooking; a plate, bowl, mug, and cutlery for eating. All the block kitchens are supplied with microwaves, kettles and toasters. Cleaning supplies. For cleaning yourself, make sure you bring a towel or two, and whatever toiletries you like. If you’re cooking for yourself, some kitchen detergent, sponges and a tea-towel. Many self- and semi-catered residents share these supplies amongst themselves, so it’s worth making friends with the other residents who use your kitchen! You’ll also want to wash your clothes occasionally. RMC has washing machines and driers, but you need to provide your own washing detergent and basket. Study supplies. You are, after all, coming to RMC to study. So make sure you bring along pens, paper, and whatever electronic devices you need to make that happen! All RMC rooms have Ethernet ports as well as wifi connection, so you can access the internet on as many devices as you have. There is also a computer room with printers that you can access when you need them. You will also need text books for most courses, so make sure you either get them in advance or bring enough money with you to buy them here. Many can be bought second hand at studentvip.com.au, so make sure you check that out. Staying healthy at college is important too. If you’re living at RMC you get free access to the Macquarie University sports and aquatic centre, so bring along your gym clothes and swimmers. If you’re into sport, there are plenty of university and local sporting teams, so bring along your gear and get involved! In second semester, you’ll also need some special occasion gear. One of the highlights of the semester is the RMCSA Annual Ball, so bring along a nice suit or fancy dress for the event. You’ll also want some daggy Christmas clothing for our Christmas in Winter dinner, and a semi-formal outfit for Valedictory Dinner at the end of the year. RMC is so conveniently located for shops – the Macquarie Centre is enormous and just across the road. Whatever you forget you can easily purchase there, or buy online and have it delivered straight to college. But hopefully this post will give you an idea of what you need to start your life at RMC well.